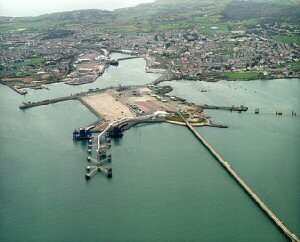 Holyhead is one of the UK's busiest ferry ports. There are about 8,000 conventional and fast ferry movements a year with over 500 calls per year of bulk carriers, cruise liners, coasters and large fishing vessels with countless calls of smaller fishing vessels and leisure craft. The 2.4 kilometre long breakwater shelters an area of 260 hectares comprising the Inner, Outer and New Harbours. There are four sites suited to visiting vessels, as well as two sheltered anchorages with launch landing facilities nearby. Pilotage is compulsory for all vessels of a length exceeding 40 metres. The separate Fish Dock caters for fishing vessels. Contact details: Turkey Shore Rd, Holyhead, Anglesey Tel. 01407 760139 Dockmaster: G. Lowe.